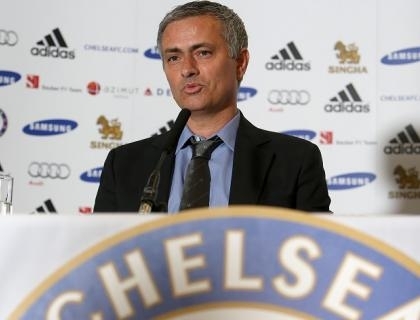 Speaking at the official media unveiling at Stamford Bridge, Mourinho was pressed for his thoughts on the appointments of title rivals United and Manchester City, who are expected to unveil Manuel Pellegrini later this week. "They have made good decisions," he said. Mourinho, 50, was touted as a possible replacement for Ferguson at Old Trafford, with the 71-year-old finally stepping aside at the end of last season. The Portuguese coach, who has signed a four-year contract with Chelsea following his departure from Real Madrid, maintains Moyes deserves his shot at one of the highest profile jobs in world football. Mourinho added: "David proved himself at Everton. Okay, no trophies, but it's not easy to get a trophy when you manage Everton and he was not far from doing that. "He has good experience, good work. I am more than happy, and I feel very happy for him. Man United will give him the time to adapt to a new dimension. "He has never played a Champions League match so people can't expect him to be a fish in water in that first match. Give him time, stability. United is perfect for that, so that's a very good choice." Despite being overlooked for the United hotseat, the former Porto and Inter Milan manager insists he would not want to be anywhere else. "I am where I want to be. You tell me now every job in the football world at this table, I would choose my job. So I have the job I want to have," he said.